21 new records have been ratified over the past two years! Malric Leborgne effectively stepped down as a committee member a few years ago. Larry Lem has stepped down as a committee member. Warren Beauchamp has stepped down as temporary provisional commissioner. Two veteran racers have stepped up to run the WRRA. Mike Mowett has volunteered to become the new WRRA commissioner. Yay! Larry Oslund has volunteered to be a new committee member. Yay! Thomas van Schaik has moved to China and stepped down as committee member. Lots of things happened so far this year in our little organization. Sean Costin has stepped down as Commisioner. All of the unratified records were removed from the site. This was mostly records set at the Appeldoorn, Netherlands velodrome. The reason they were unratified is because the race organizer did not provide us with adequate documentation. The WRRA now will approve high altitude records with notation in the "additional information" page (you get to that by clicking n the icon next to the record). Approved Phil Plath's 200M and 1 hour master records. Approved Matthias Konig's 100 mile record. Thomas van Schaik has accepted our invitation to become a new records committee member. His experience on the recumbent racing scene and his engineering knowledge give him the perfect background to make rules and decisions on record attempts. His geographic location will provide us with presence at record attempts in Europe which will lead to better universal compliance to rules and faster ratification of records. 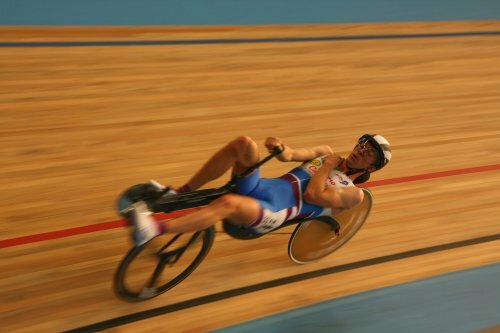 In 1998 I bought my first recumbent, a Flevo Racer. 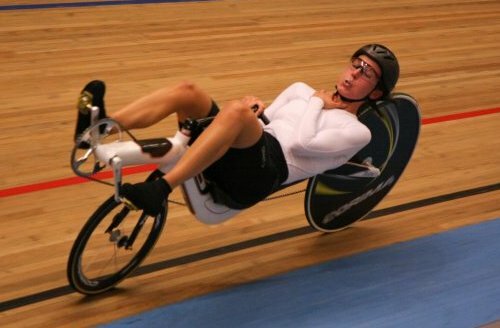 I just started at the University for Technical Education in Haarlem where I went to study aeronautical engineering, the link was quickly made to the aerodynamic advantages of a recumbent. Cycling holidays went well from then on, 180km in one day was suddenly no longer a problem, indeed, my first holiday with the Flevo Racer was to the European Championships in Denmark. The first day I drove like 240km, in the evening we played some soccer! Today I still drive that bike, now almost 120,000 km on the clock. During my studies I built a Flevo Racer with 2 × 20”. I drove it a couple of competitions. A nice fast bike but still not fast enough. I felt the need for SPEED! In my last year I did my graduation for J & S Cycle Services (which later became known as Velomobiel.nl). I designed a fully faired bicycle for Ymte Sybrandij to be able to attack the world hour record (at that time Lars Teutenberg in the Whitehawk). Due to the Dutch weather, and my long commute (40km) I decided to build a velomobile. In order to keep costs low, the tandem was sacrificed and a homemade velomobile was built in 9 months time (a difficult delivery indeed!). After a couple races at the race track in Zandvoort I decided I needed a faster bike, so I bought a second hand Optima Baron. This bike, over the years, has been modified so that it no longer resembles the original bike. Since 2000, I work as a Design Engineer for Aircraft Structures with KLM Engineering and Maintenance in the Netherlands. Currently I am involved as a Team Manager in the “KLM Engineering & Maintenance Knowledge- and Capabilty-level, Aircraft Composites”. This project has close relations with the Commercial Aircraft Composite Repair Committee (CACRC). 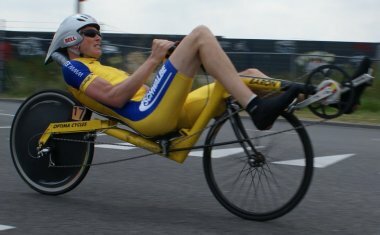 2009 was a banner year for the World Recumbent Racing association. The effect of the WRRA rules, organization and the web site have led to a significant improvement in performances. Recumbent bike designers, builders and athletes have proven that they are up to the challenge and the seem to be feeding off of each others' success. In particular, the Men's one hour was very competitive in 2009 and in one weekend, the record was increased 3 times. There are still many open opportunities in which records have not yet been established and we hope that this year, we can start the ball rolling in these categories. 2009 concluded with a record smashing World Record Weekend in Apeldoorn, Netherlands Unfortunately the method of measuring the speeds and times did not meet WRRA standards, so the record setting performances were not ratified. Unratified Men's hour record now stands at 52.074km (32.35mph) ! Unratified Women's hour record now stands at 46.34kph (28.8mph)! Barbara Buatois of France showing her neck embrace position during her attempt at Apeldoorn. The recumbent men's hour record his quickly making up ground on the UCI record since the inception of the WRRA as illustrated in this graph. Trike records are now being recognized! Trike Recumbent definition: Same as Unfaired Recumbent, except vehicles in this class must have 3 or more weight bearing wheels, and two of those wheels wheels must have a minimum track width of 250mm. The WRRA committee feels that the inclusion of trike records will spur technological development in this design type which will have an influential effect on commercially available trikes and velomobile design as well as open up opportunities for athletes who prefer this type of vehicle. We are now looking to review performances set on recumbents that fall into WRRA classes. These records would include RAAM, Paris Brest Paris, Sebring 12 and 24 hour, Cape Argus Tour, etc. Performances that do not qualify to standard categories of the WRRA would also be listed, such as those set at high altitude, where verifiable measurement data does not exist or in distances not currently recognized by the WRRA. Straight line records are accepted by the WRRA for 200M and Kilo distances.